Windows Phone 7 was built from the ground up and the developers did a phenomenal job rebooting Microsoft’s mobile OS. There is still plenty of work to be done and 2011 should bring a bevy of updates. Here’s the ten things we’d do to improve Windows Phone 7. Speed. Windows Phone 7 is plenty fast within the confines of the OS. In-app speed needs to be faster. Currently, some apps perform better than others, but it’s still needs improvement. The overall UI is fast. We need apps that launch faster and offer better performance across the board. I’ll even trade some of those fancy transition graphics if we can achieve more speed. Landscape keyboard support in Internet Explorer. If you’re browsing in landscape mode, there is no way to bring up the browser bar. You have to go back into portrait mode and then you have access to the address bar. Tap To Top. If you find yourself at the bottom of a long Twitter feed or with email, there is no easy way to get back to the top. You can slide right and back left in email. Why not allow apps like Internet Explorer, email and third party apps to allow you to tap to return to the top of your list. Screenshot capability: Admittedly, this is a request from a blogger whose job would be made easier if he could take screenshots. iOS and webOS make this real easy. Android has the feature, but requires downloading the SDK and connecting your Android phone to your Mac/PC. Adding the ability to take quick screenshots would be a welcome feature. YouTube App. Microsoft did a good job getting key apps available for launch. Facebook, Twitter among those offering up solid efforts, but not so much with YouTube. The Marketplace download is just a redirect to m.youtube.com. It’s time they offered up a full blown app. On the iPhone and webOS, YouTube is an included app. Windows Phone 7 needs to include a capable YouTube app. 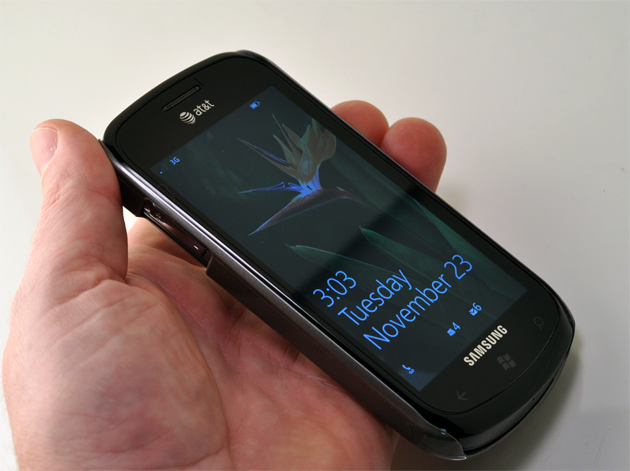 Easier To Answer Calls: To answer calls on Windows Phone 7, you have to swipe up to unlock the screen and then select “answer”. For those counting at home, that’s two taps and one too many. microSD Mess: Microsoft has been clear about microSD support, but it appears the manufacturers didn’t heed the warning. The result being phones on the market that have an easily accessible microSD card slot. It’s natural that most will look to add memory to their phones. Microsoft expects to offer up information on compatible cards, but it’s still a bag of hurt. Cards that are not compatible become toast (unless you’ve got a Nokia lying around). This needs to be more consumer friendly. This likely means a change in how the OS manages data. Make it happen. Make it easy for us to add memory cards. Custom Ringtones: There is no way to add custom ringtones. People love ringtones. They don’t want to pay carriers for ringtones. They simply want to download them off the Internet and have an easy way to add them to their phone. The more you can customize ringtones for callers, text messages, the better. Homescreen Customization: Personalization is big on phones. The beauty of Windows Phone lies in its simplicity. Not everyone loves simplicity. What if you allowed a fully customizable multi-tile mosaic. Users could select the number of tiles to use, ability to select one or more photos that would rotate into the homescreen. Extending the capability of the current Pictures app might help bridge the gap between simplicity and customization. I’ve narrowed this list down to ten, but there are numerous changes that can be made to improve upon Windows Phone 7 and hopefully we’ll get news of a forthcoming update that will address this list and more. Windows Phone 7 is a great starting point. Now it’s time to refine the OS. Did we miss something? Let us know in the comments or in the forums. In case some MSFT people read this – a good example site that does not render well in IE on WP7 is caringbridge.org (or patient pages specifically) – for some reason the browser won’t let you zoom out enough to see the whole page, and instead you have to scroll around it to read things. The Outlook functionality for NON exchange users MUST be added back into the WP7 environment. I am trying to stick it out but this is putting me in a major bind and I have spoken to many associates of mine that just wont upgrade from 6.5 or will swtich platforms because of this one problem. This ability worked fine and had been perfected though time and to remove it is to remove the heart of the Windows Phone base. 1. Visual Voicemail. I know this may be an AT&T controlled issue, but Microsoft needs to put some pressure on them. 2. Collapsible caller lists. If someone calls me repeatedly, or I have to redial someone a number of times, their name takes up the entire recent caller list. Give us the names or number of the caller sorted by time, with the number of calls to/from that person. 3. Multitasking!!!!! At least let me keep listening to a video podcast if I blank the screen for battery conservation. I love my Focus, and WP7 will be a no-brainer when turn-by-turn nav arrives and the app store matures just a little bit more. Great suggestions though! I do love my WP7 phone but I’m hopping people at MS are reading this. Thanks! 1) The application opening speed is an application developer issue, not the OS. I have to slow down opening up my apps. if I want to show a splash screen. If I don’t slow down the opening, it launches immediately. I think most of the slow apps. try to do web communication before it is loaded and therefore appear slow. 6) The gestures required to answer the phone don’t bother me. I think it prevents accidentally touching the answer button when that isn’t what you wanted to do. The app loading time is in fact an OS issue. WPOS limits the amount of memory an app or game can use for pre-loading graphics. Direct sync to Outlook on my Windows computer – seems like this was an intentional oversight and we are being pushed toward the cloud, which may be a good thing. TweekUI program – Would solve many of the issues here: individual sound levels for different events. For example, can’t turn down or off the annoying sound when you plug it in to charge. A TweekUI program should be a simple object oriented program to write. I’d also like a file manager as in the previous OS. At least some form of syncing for ALL of Outlook, particularly multiple calendars. I cannot use the WP7 device that is sitting next to me on my desk UNTIL they allow for multiple calendering, as the calendar organizes my life! Forgot to add – Skype. Bottom line looks like wait and see the success of Windows Phone 7. The camera/video portion of the OS needs to be addressed. Any changes you make to the settings don’t stick. I hate selecting 720P video only to have it revert back to VGA next time I open the app. 3. If outlook connector can connect with Live, why can’t a similar app be developed to connect Outlook directly with the phone. The browser should be more like the Android one, with word wrapping! I would like the People and Photo hubs to update content much faster. Sometimes it takes up to 25 seconds and that is unacceptable. I would like the ability to download/save photos that are posted by by Facebook friends directly from the People and Photo hubs. I cannot see appointments in the month view of the calender. Switch to colored icons instead of text. Improve the suspend state/caching for apps. I’m tired of seeing ‘resuming’. The YouTube only being a redirect to m.youtube.com is not entirely correct. Before installing the YouTube app, I tried to watch a video from m.youtube.com, and it told me I had to install the YouTube app first. Perhaps it installs some sort of 3GP codec or something similar – but it’s definitely more than just a link. I’ve also used the same route to determine that the YouTube App is more than just a redirect to m.youtube.com as it installs the codec neccessary to view YouTube videos (and perhaps also linking YouTube to Zune since recently viewed YouTube videos show up in the History section of the Music + Videos Hub). What bothers me, about the YouTube App is that I don’t want a shortcut to YouTube in my Apps list. It clutters up the list and I don’t need it. I’d rather just type http://www.youtube.com in the address bar of IE to get to YouTube or keep it as a Favorite in IE. I can’t remove the “shortcut” without uninstalling the codec. It’s really annoying. I have the same issue with the Adobe Reader App. It’s really just a plug-in that allows you to view PDFs that are attached to e-mail messages. I don’t need a shortcut to the Adobe Reader in my Apps list, especially if I can’t open up a PDF document because there is no file manager (I don’t have access to a SharePoint server so I have yet to play with the Office Hub to determine if I can use it as a file manager for non-Excel/OneNote/PowerPoint/Word documents. I really can’t wait for SkyDrive implementation. That will make the phone REALLY useful). What I think would help is to allow people to remove the shortcut to an App from the Apps list without unistalling it and have uninstallation be managed through a “Change or Remove Apps” item in the settings menu. I also think it would be great if the system allowed users to create their own App hubs to group similar Apps together. Personally, I’d like to see all of the AT&T Apps that came preinstalled on the phone listed under an “AT&T” Hub. Or list my calculator and unit converter under a “Calculators” Hub of my own creation.